IT WAS BOXING DAY 2002. 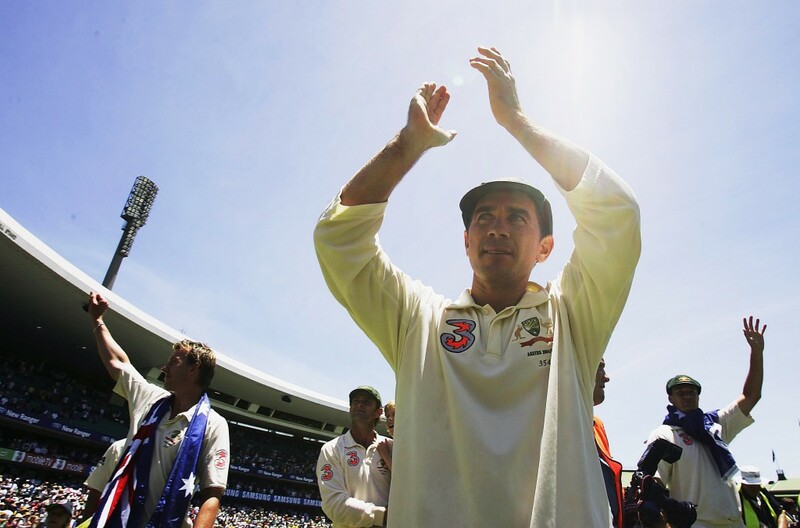 Justin Langer walks out onto the Melbourne Cricket Ground to face the first ball of the Ashes Test match against England in front of more than 63,000 spectators. It’s an exciting, heart-pumping atmosphere, but something happens that will forever be etched in the West Australian’s mind. The man nicknamed ‘JL’ went on to make 250, his highest Test score, while fellow opening batsman Matthew Hayden also reached triple figures. Four years later Langer and Hayden had become Australia’s most successful opening batsmen, and one of the most prolific pairs in cricket history. The secret to their success? The cross. “Matthew Hayden and I, every game after that, we used to put the cross on the turf,” Langer told The Record in an interview recently. Langer made his debut for the Australian cricket team in 1993 as a 22-year-old, but struggled to retain his spot in the side, playing just three Test matches in the space of five years. He says it was a difficult period, but his faith in God helped him get through. “In life we all have down times, but to have that faith and to have those Scriptures to draw on, really it’s beautiful,” he says. In November 1999, Langer played the innings of his life to lead Australia to an unlikely victory against Pakistan in Hobart. He says the innings was a turning point in his career. While cricket fans around the country will remember Langer’s famous knock fondly, what they may not know is that during his stay at the crease he was meditating on a Bible verse. Langer begins the story a month earlier in WA, soon after returning home after a difficult tour of Sri Lanka. “It was a horrible tour, I couldn’t face Muralitharan the spin bowler, and I came back and I was in no man’s land even though I was back in the team,” he says. At training, something inspired him to speak to the WACA’s pastor, Andrew Vallance. “I said “You know Andrew, I just can’t work it out mate, I’ve got everything, I’m living the dream, I’m playing cricket for Australia, I’ve got lots of money, I’ve got a beautiful family, I’ve got a fancy car, I’ve got a big house, but something’s missing, I just can’t work it out,”” Langer explains. In response, Vallance simply asked Langer “Have you read the Bible lately?” to which the bemused batsman answered “No, I haven’t”. “The next day we were travelling interstate, and [Andrew] came to the airport with his children and his wife, and they presented me with a leather-bound Bible,” he continues. Langer began reading the Bible during the flight, and was struck by Philippians 4:13, which he interprets as “God gives me the strength to achieve anything”. It was his inspiration for the greatest innings of his career. “All I said every ball for six hours was “God gives me the strength to achieve anything”, it was like a mantra, it was like I was meditating,” he says. Langer says his performance that day proved to him that he could perform under great pressure and against quality opposition. “It was important for the Australian cricket team too, it was the second Test Match victory of our world record run of 16 straight Test Match wins. We felt then if you could win from that position, we had the people to win from any position,” he says. While cricket was in his blood, with Uncle Robert Langer representing WA in the 1970s, it was other endeavours in his childhood that Justin prizes the most. “In Year 7 I was awarded the Christian Leadership Award, which is still a thrill,” he says. Recently, Langer’s daughter won the same award at Iona Presentation College. “I was more thrilled for her to achieve that than any scholastic or sporting achievement because I think it’s a really nice award,” he says. The cricket star’s family also has a strong connection with St Joseph’s parish in Subiaco. His grandparents were a part of the parish for many years, and Langer now attends Mass at St Joseph’s every weekend with his family. While he lists Fr Walsh as one of his role models, the 42-year-old also has a strong devotion to the patron saint of travellers. “My grandmother, who died about 15 years ago, gave me a beautiful St Christopher fridge magnet which I still have with me,” Langer says, while showing me the St Christopher medallion he has tied to his wrist. After retiring from international cricket in 2009, Langer became the Australian team’s batting coach for the next three years before being appointed as the coach of the WA side. He says being back at home permanently has many benefits. “One of the reasons I came back to WA to coach was so I could spend more time at home,” he explains. “Leading up to this job, I was on the road for 11 months of the year all around the world or interstate. Having spent 15 years at the top level, Langer is reflective when asked if being a high-profile sportsman ever challenged his faith. “The lifestyle of professional sport, and being on the road all the time, and being around the world, yeah, you get challenged, there’s a lot of temptations,” he says. “You’ve got to deal with – and I hate the words – the fame and money that comes with being a professional sportsman. Fortunately, Langer says the make-up of the Australian team during the ‘golden era’ that he was a part of included many outstanding individuals who had good morals and values. “A lot of the guys maybe haven’t had a Catholic upbringing but… Steve Waugh, Adam Gilchrist, Ricky Ponting, and Glenn McGrath, they can’t do what they do for other people without having a strong spiritual life, they’re just such incredible people,” he says. Critics might argue that the team’s success was due to their “bullying” tactics and penchant for “sledging” – verbally intimidating the opposition. But Langer says as long as it doesn’t get personal, it’s just another part of the game. “Players know it’s a very fine line,” he says. “If it gets personal, it’s no good. But if it’s all part of the gamesmanship of me trying to put you off your game and get you concentrating on something else other than winning the contest, well then it’s all part of the game. Playing hard may also mean not “walking” – voluntarily leaving the pitch when you’re out even if the umpire makes a mistake – according to Langer. During his match-winning innings in Hobart, the left-handed batsman controversially stood his ground when he was given not out after nicking a ball through to the wicketkeeper. While he has admitted he did hit the ball, Langer says his decision not to “walk” doesn’t mean he’s dishonest. “Sometimes if I’m in a bit of a hurry and I speed, I go 70 in a 60 zone, I don’t go and dob myself in to the local police station do I? Looking back over his career both as a player and a coach, Langer says the sport has taught him a lot about himself and about life. “The brilliant thing about my cricket career is not that I earned a lot of money, not that I’m secure, but the lessons I learnt from cricket,” he says.